The monster awakes in the morning and wants to RAMPAGE! Or go for a contemplative walk in the woods. Oh dear. What a conflicted beast. It may be true that two heads are better than one, but three or four? Well, that leads to all sorts of complications. 3 to 4 Headed Monster set up for four. If the total is between 1 and 8, the monster rampages, and the rampaging heads are closer to winning. If the total is 9 or higher, the pacifist head is closer to winning. The game ends either when the feet are peaceful twice or rampaging thrice (a direct victory for either side). 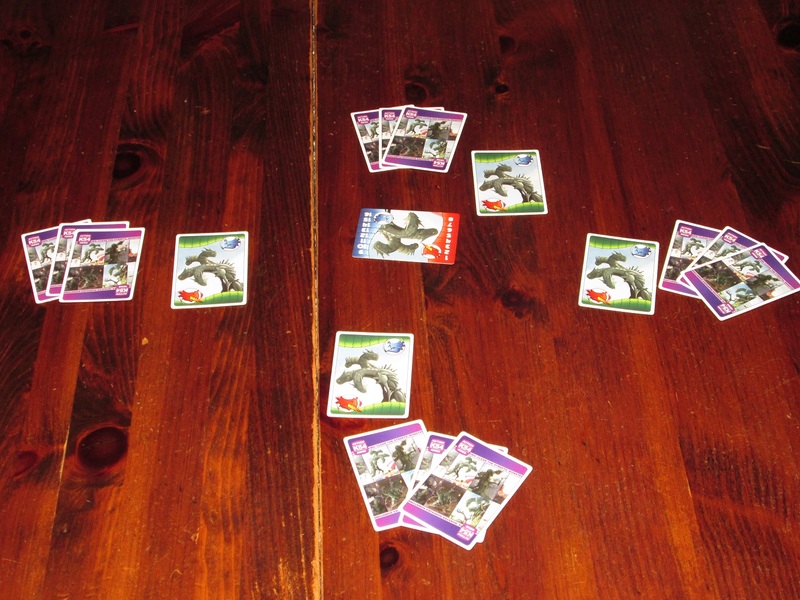 Or, after three rounds of players controlling the feet, if there is not a clear winner, whenever two players agree to play their role cards to the center, those cards are revealed. If the pacifist card is one of the cards, the pacifist wins. Otherwise the rampaging heads win. “Filler” games are a staple in the hobby–games that can fill holes in an evening, either because Always-Late Jenny is living up to her name, or because Analysis-Paralysis Andy is causing the other game to run long. I’ve written about filler games in the past, and there are lots of them that I love. 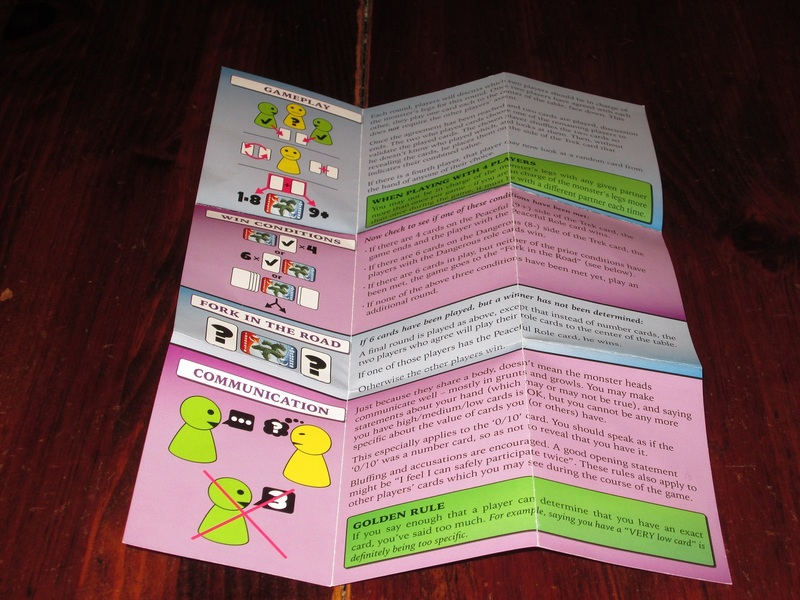 But 3 to 4 Headed Monster is making me rethink why we play filler games in the first place–and whether it’s worth it. So with these two strikes, it should seem pretty obvious before I say anything else that 3 to 4 Headed Monster is not for me (and it isn’t). But is it for you? Obviously, that’s a question only you can answer. But my guess is that it won’t be for you, either. 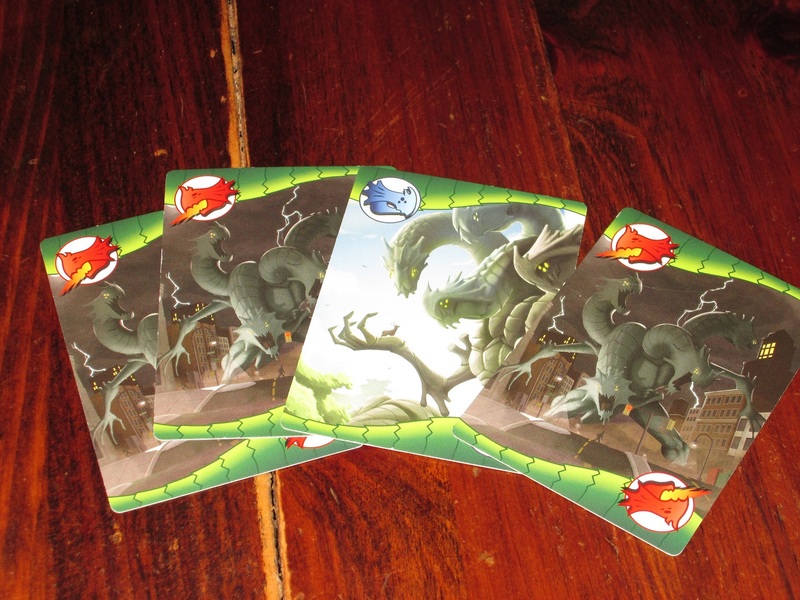 The role cards in 3 to 4 Headed Monster. You are either a pacifist or a rampager. I find 3 to 4 Headed Monster a bland package from start to finish. 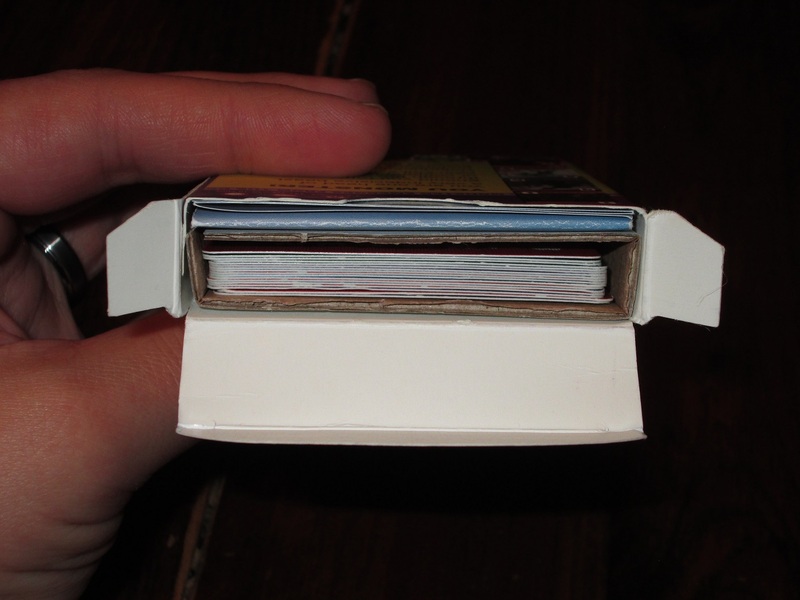 It comes in a small reinforced tuckbox with seventeen cards and a small rules sheet. It’s not a promising start when the thing that excites me most about a package is the tuckbox reinforcement. The cover art chosen for the tuckbox is boring, and it doesn’t get any better once you pull out the cards. The monster is very slightly drawn (“slight” is a word I’ll return to), and the cards are so dark that there’s not much detail to appreciate. The news tickers across the cards are a little funny, but that doesn’t redeem the look of the cards. The cards in the game. The distribution favors the pacifist slightly. I don’t care for the artwork. That shouldn’t matter much: poor aesthetics are forgivable if the game is good. (I play old Euros, for Pete’s sake.) To me, though, this game is too slight to bear that description. The game involves three plays–that’s it. Only three chances to control the legs; only three chances to receive information. It’s possible for the pacifist head to win without much forethought, simply because there’s not much time to deduce who that head might be and because the distribution of cards is weighted toward pacifism. I suppose this ought to focus the game. “You’ve only got three plays, so you have to make them count!” And it does, in some respect, except that there are many unknowns in the game. All you know about the other players is what cards, between them, they are holding. The deck is small enough that you could probably memorize them, but for casual play, this isn’t likely. What you have to go on is other players’ word, and one false move can unravel the game. So unlike, say, The Resistance–where you get to track how players vote, how players discuss, and what happens on the missions (and there are as many as five missions)–here everything is riding on three short rounds. The Trek card is double sided. One side shows the win conditions for each side. This side shows you how to score the game. As I mentioned, the game is weighted in favor of the pacifist, presumably because there is only one. There are more moderate- to high-value cards than low cards, and even most moderate cards combine toward pacifism. The rampaging heads really have to work together if they want to unravel the puzzle. This is possible but difficult since the game’s natural channel is toward higher totals. I don’t mind this so much, but it does seem like the cards you are dealt make the game easier or harder for you. And this is where the bluffing (read: lying) comes in. If you’re comfortable with lying, this isn’t too bad. You have to find the lie that works for your cards and run with it, hoping that the other players believe you. For me, this is much less satisfying than other social deduction games, where lying takes a backseat to misdirection. In One Night Ultimate Werewolf, for example, even the non-werewolf players are trying to discover what happened in the night, so it behooves them to misdirect as well. In Insider, the player with the intel is just trying to ask good questions (without their seeming too good), so it’s easy to remove yourself from the lie, especially if you enter into what the other players must be thinking. There’s no such removal in 3 to 4 Headed Monster. If you have the high cards you need, you lie about having the cards the other players need. And if you don’t have the high cards you need, you hope the other players do your work for you. That’s a simplification, sure, but not an oversimplification. With such a bite-size package, there’s not as much room for maneuvering as in better social deduction games. I will say that the game with a 4 Headed Monster is more enjoyable than with three players. For one thing, a player may not control the legs with another player more than once, and for another, there’s more breathing space and (concurrently) less certainty. To put this in perspective: I will never willingly play this game with three again. I could possibly be coaxed into a four-player game in extenuating circumstances. There is one interesting card in the game, and that’s the 0 to 10 card. This card, when paired with a low card, makes the legs automatically move toward pacifism (it’s a 10!). When paired with a high card, it’s a 0, keeping the monster rampaging. Playing the card is always a risk, because you really have to know what the other player is playing to use it effectively for your goal. This is the game’s most interesting decision point. Unfortunately, this interesting decision is marred by the calculation that the verifying player has to do. Each set of two cards has to be “verified” by a third party, who places the cards on one side of the “win” tracker. With number cards, the cards always get added together quickly and placed. With the 0 to 10 card, the player can often be seen puzzling its meaning out, trying to make sure it’s placed on the right side. This two extra seconds, while seemingly unimportant, always clues the other players in to what has been played. Maybe this extra thinking time goes away with experience, or maybe your group will be more careful about this, but in mine, this was a consistent problem across all of my seven games, no matter how much I explained this card in advance and despite these players playing multiple games with me. I’ve spent a while saying why I don’t like 3 to 4 Headed Monster. There are some things that, despite the bland game, I found enjoyable (oases in the desert?). For starters, the premise sounds kind of funny: “You are one head of a very indecisive beast.” The idea of two heads controlling the legs for a round is a funny one, and the rules against revealing what’s in your hand create interesting banter around the table. “I feel like I could rampage today” is a common phrase. “I’m a little cool on rampaging at the moment” is another common one. It was enjoyable to hear another player dancing around revealing information about his hand, using many words to little effect. These fun moments notwithstanding, I don’t care for this game. But is there an audience who will enjoy it? I think players who like the pointed bluffing of Skull, Cockroach Poker, and even Coup might. 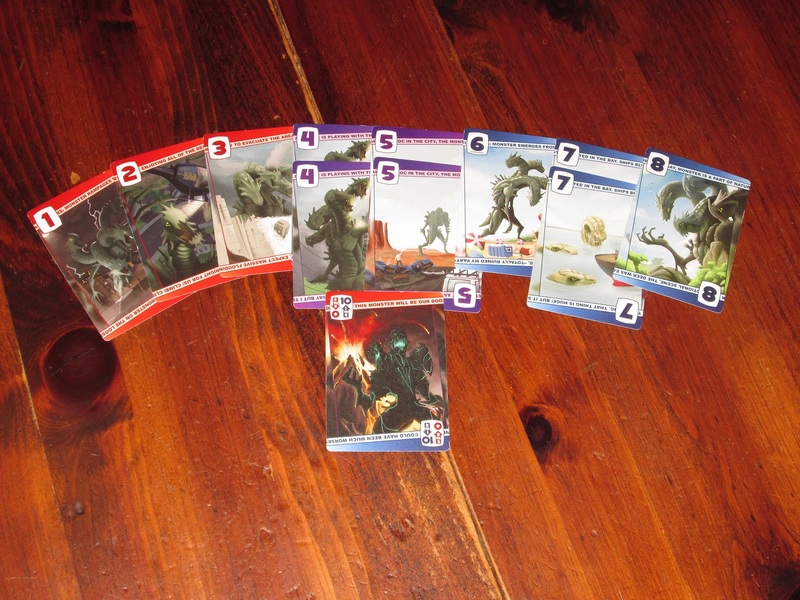 Especially in a three-player game, it’s easy to feel cornered. If you find being the spy in Spyfall or the werewolf in One Night Ultimate Werewolf exhilarating, you might like this. If you’re willing to lie to your friends’ faces just for the pure joy of it, this might be for you. For me, I would much rather play other social deduction games, which make lying seem more worth it. Then again, other social-deduction games require a full table of players. If you simply must play a social deduction game and only have a few players, this one fits the bill (although I think Coup is much better in the smaller-game space). 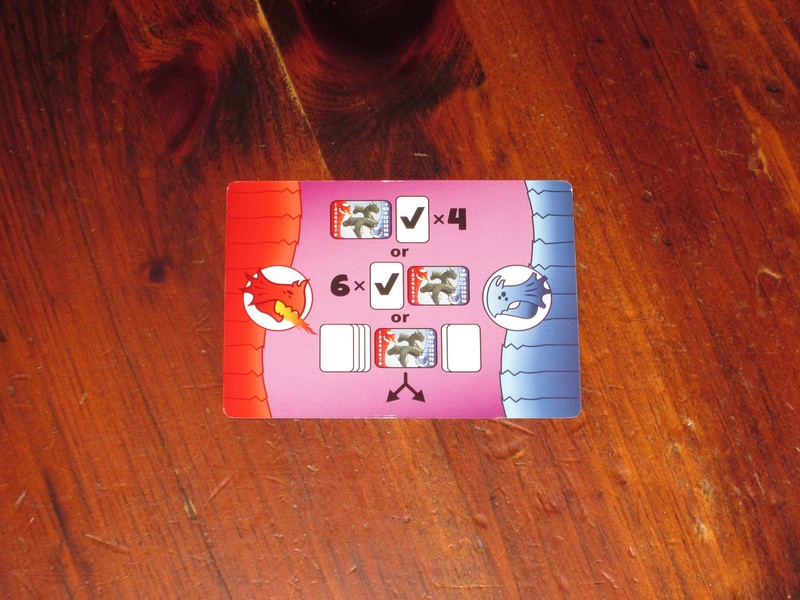 3 to 4 Headed Monster seems like the kind of game that, as some people have said of Love Letter, might develop its own “meta,” making it more interesting as players weigh each other player’s words carefully over many games and several nights. If you’re willing to play it over and over with the same people, you might get that kind of enjoyment out of it. To me, the game didn’t have enough interesting choices or psychology to warrant playing it more than necessary for this review. But I thought the same thing about Love Letter, and you might think differently. Seriously, including thick cardboard to reinforce a tuckbox? This is a great choice. I just don’t care for what else is in the tuckbox. You probably won’t. 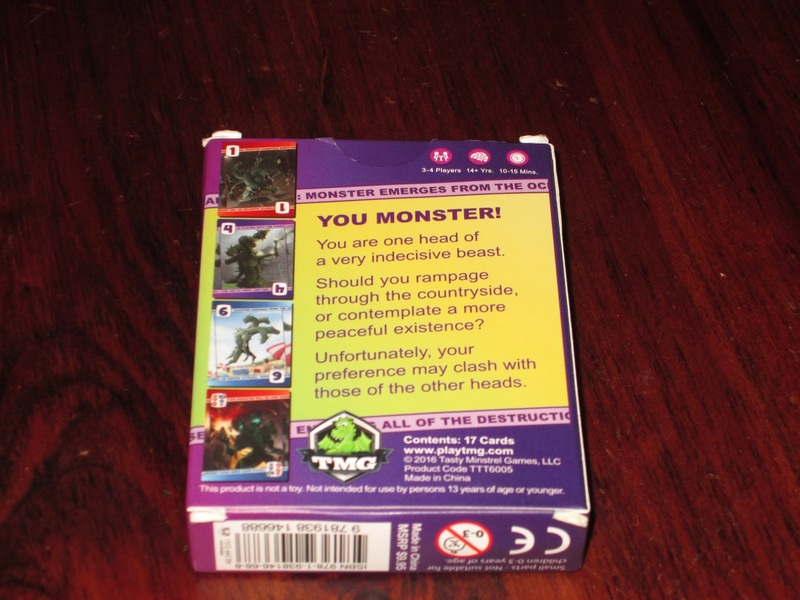 There simply isn’t much game in 3 to 4 Headed Monster‘s reinforced tuckbox, and what game is there isn’t very fun. Players are at the mercy of their cards (and unlike Coup, you can’t lie your way to better cards), and there simply isn’t enough time or space in the game to gain the information you need or to feel clever about deducing or bluffing. It’s too short to be satisfying, too slight to be interesting, and the overall appearance of the package makes it look like the publisher isn’t invested much in its success either. It is portable and cheap, though, so if you like social deduction games and often have a smaller group, maybe you’re willing to give this a try. But I think you’re probably better served by buying snacks for game night and just talking to your friends when there’s a lull than by buying and playing this. 3 to 4 Headed Monster is a strong argument that not every game night gap needs to be filled with activity. 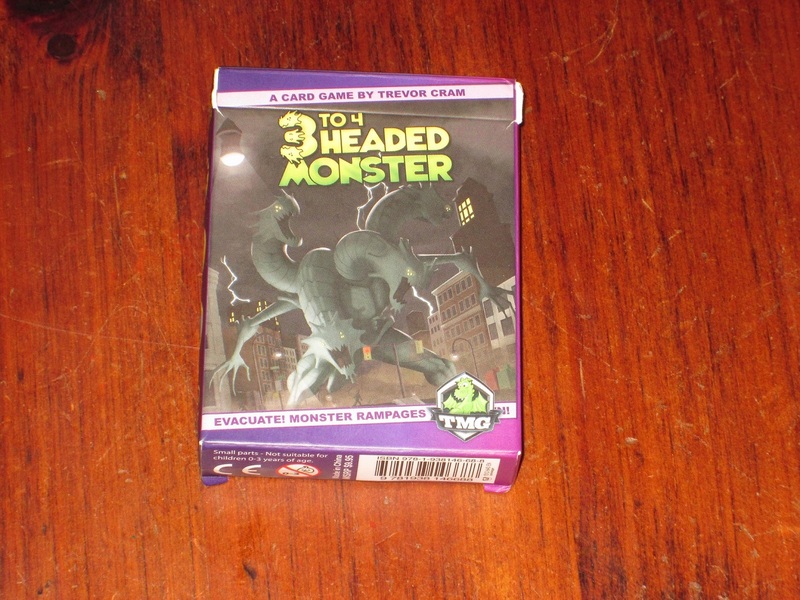 iSlaytheDragon would like to thank Tasty Minstrel Games for providing us with a copy of 3 to 4 Headed Monster for review.